Randy Lerner has fuelled up the private jet and made a stop in Norway. Interesting. Molde FK manager Ole Gunnar Solskjaer. ASTON VILLA ARE in talks with Molde coach Ole Gunnar Solskjaer for the Premier League club’s vacant managerial position. A former Manchester United star, Solskjaer is to jet into Birmingham toay to meet with Villa owner Randy Lerner over the prospect of taking over first-team duties. The 39-year-old is believed to have been flown over in Lerner’s own private plane to meet with the American entrepreneur, and he is now the frontrunner to succeed Alex McLeish as boss. 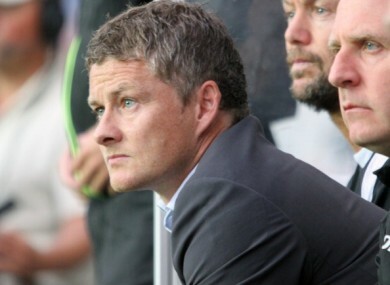 Solskjaer led Molde to a historic double this season in his first full campaign in charge, and should he leave to take over Villa, he will be giving up the opportunity to manage in the Champions League next season. He has previously spoken of his desire to manage Manchester United one day, having departed his role in charge of United’s reserve team to take up the position in Norway. Email “Aston Villa in talks with Manchester United legend Solskjaer ”. Feedback on “Aston Villa in talks with Manchester United legend Solskjaer ”.